BREAKFAST WITH SANTA (Dan Trimmer) Tetraploid (Calamity Jane x Martin Blondeel) 31" 6 1/2" E. Re. Ev. 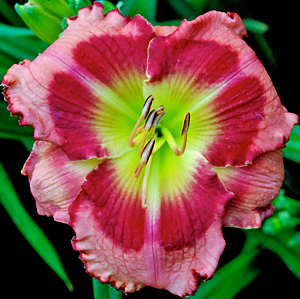 Typical bud count on my very best red eyed, pink daylily to date is about 55. Please realize I have worked with these colors in excess of 20 years so to say it is my best is a strong endorsement.. This year’s best scape had exactly 70 blooms which opened perfectly every day. Very pod fertile, even in the full sun here in cental florida, I easily set as many pods as I desired this past bloom season. 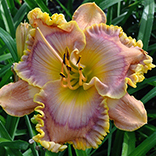 Low arched foliage assured that each bloom was well above the dark green vigorous leaves. BREAKFAST WITH SANTA should be a very important parent for the warm colors I enjoy so much.